Today is day #66 of the NHL lockout. I have an almost-4-year-old son, and to him, 66 days feels like a lifetime. That’s 66 days of explaining to him why he can’t watch his favorite team and his favorite players turn into idols before his eyes. That’s 66 days of explaining to him what ‘lockout’ means, and nine Saturday nights of missed Hockey-Night-in-Canada memories. That’s 66 days of baby-faced disappointment. I am trying to teach my children the values of humility, need-vs-want, and family. Instead, what I see from you is an ongoing display of greed, ego, and entitlement. As players, you get to play the game that you love. As owners, you get to be surrounded by the game that you love. As fans, we are missing out on the game that we love. I’ve been a true Canadian hockey fan my entire life. I spent my childhood Winter days at a small rink in an Alberta prairie town. I learned how to skate on a shoveled-off pond. I had Dale Hawerchuk posters on my wall in Grade 4 and Pavel Bure jerseys in my closet in Grade 9. I go to see a few games a year. I bring my kids. I watch hockey highlights religiously. If the local team is playing at Home when I’m on vacation, I go to the game. I’ve been to multiple NHL arenas and several Stanley Cup playoff games. I’ve been to World Juniors and World Championships, and I’ve watched more grassroots, small-town hockey than I can remember. But you’re losing me. My interest is fading. My love for the game is dwindling. My annoyance and frustration and apathy are growing. I don’t care who’s right and I don’t care who’s wrong. Find a way to fix it. Because every day that the lockout continues is another day that born-and-bred fans like myself grow further from the sense of Canadian pride, patriotism, and belonging that hockey brings to us. Make me feel encouraged and supportive that my son wants to be a hockey player when he grows up. 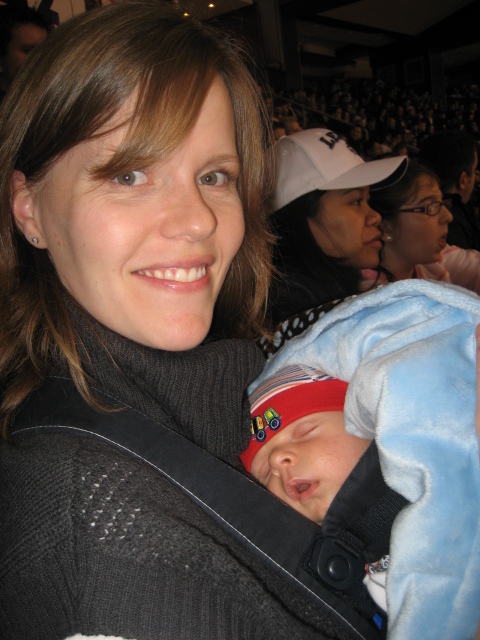 Fostering a love of hockey with my first-born at 6 weeks old. Leafs vs Oilers, March/2009. This entry was posted in Opinion and tagged Canadian pride, hockey, NHL, NHL lockout, NHL owners, NHLPA. Bookmark the permalink. Yes! There is so much great non-NHL hockey out there to enjoy! Please don’t lose your love for the game. Junior hockey is in full swing and is the best type of hockey there is – even if there wasn’t a lockout. No shortage of passion and commitment there. Junior hockey is my all-time favorite!! And Boxing Day just isn’t the same without watching Canada’s opening game at the World Juniors!